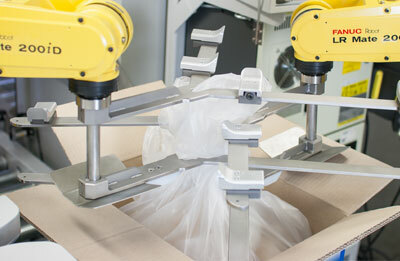 This high-speed pick&place system demonstrates that even difficult-to handle products, such as items consisting of half-baked dough, may be safely packed in boxes in record time and by a six articulated-arm robots and the boxes intralogistically transported to a labeling station and palletized. 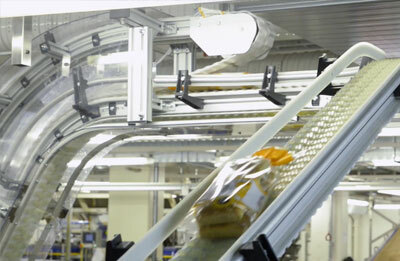 Innovative sandwich conveyor for gently conveying products in tight quarters. New: An ATEX-certified bag-closure machine closes big bags without exposing handling personnel to hazardous substances during filling operations. 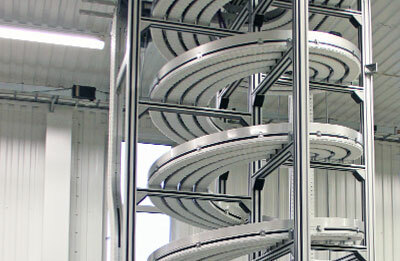 This spiral conveyor allows space-saving bridging of large height differences.